The TCP/IP port allocation on Windows by default includes a restricted number of ports available for client communication. For more information on this issue, including information on how to adjust the configuration and increase the available ports, see MSDN: Avoiding TCP/IP Port Exhaustion. The Couchbase .NET Client Library store operations set information within the Couchbase database. These are distinct from the update operations in that the key does not have to exist within the Couchbase database before being stored. The ExecuteStore() method is used like the Store methods, but instead of a Boolean, returns a IStoreOperationResult, which provides detailed information about the success of the operation. Name = "The Audacity of Hops"
Name = "Long Trail Ale"
ExecuteGet() behaves as does Get() but returns an instance of an IGetOperationResult instead of directly returning the item for the key. ExecuteGet() also has a generic form to allow an item to be retrieved without casting. GetWithCas() will return a CasResult with the Cas value for a given key. Calling ExecuteGet() with multiple keys returns a dictionary where the values are instances of an IGetOperationResult. As with Append() ExecuteAppend() may also be used with a CAS value. With this overload, the return value is a IConcatOperationResult. The check-and-set methods provide a mechanism for updating information only if the client knows the check (CAS) value. This can be used to prevent clients from updating values in the database that may have changed since the client obtained the value. Methods for storing and updating information support a CAS method that allows you to ensure that the client is updating the version of the data that the client retrieved. The check value is in the form of a 64-bit integer which is updated every time the value is modified, even if the update of the value does not modify the binary data. Attempting to set or update a key/value pair where the CAS value does not match the value stored on the server will fail. Store a value and get a CasResult with the Cas for that key. Cas() may also be used with a CAS value. With this overload, the return value is a CasResult, where success is determined by examining the CasResult’s Result property. Perform a check and set operation, setting a TimeStamp expiration on the key. Perform a check and set operation, setting a DateTime expiration on the key. Store a value and get an IStoreOperationResult return value. ExecuteCas() works like Cas() and may also be used with a CAS value. With this overload, the return value is an instance of an IStoreOperationResult. Perform a check and set operation, setting a TimeStamp expiration on the key. Return an instance of an IStoreOperationResult. Perform a check and set operation, setting a DateTime expiration on the key. Return an instance of an IStoreOperationResult. Decrement the inventory counter by 1, defaulting to 100 if the key doesn’t exist. Returns an IMutateOperationResult. Decrement the inventory counter by 1, defaulting to 100 if the key doesn’t exist and set an expiry of 60 seconds. Return an instance of an IMutateOperationResult. Decrement the inventory counter by 1, defaulting to 100 if the key doesn’t exist and set an expiry of 5 minutes. Return an instance of an IMutateOperationResult. Decrement the inventory counter by 1 using check and set, defaulting to 100 if the key doesn’t exist. Return an instance of an IMutateOperationResult. Decrement the inventory counter by 1 using check and set, defaulting to 100 if the key doesn’t exist and set an expiry of 5 minutes. Return an instance of an IMutateOperationResult. The ExecuteRemove() method deletes an item in the database with the specified key and returns an instance of an IRemoveOperationResult. Increment the inventory counter by 1, defaulting to 100 if the key doesn’t exist. Return an instance of an IMutateOperationResult. Increment the inventory counter by 1, defaulting to 100 if the key doesn’t exist and set an expiry of 60 seconds. Return an instance of an IMutateOperationResult. Increment the inventory counter by 1, defaulting to 100 if the key doesn’t exist and set an expiry of 5 minutes. Return an instance of an IMutateOperationResult. Increment the inventory counter by 1 using check and set, defaulting to 100 if the key doesn’t exist. Return an instance of an IMutateOperationResult. ExecuteIncrement the inventory counter by 1 using check and set, defaulting to 100 if the key doesn’t exist and set an expiry of 60 seconds. Return an instance of an IMutateOperationResult. Increment the inventory counter by 1 using check and set, defaulting to 100 if the key doesn’t exist and set an expiry of 5 minutes. Return an instance of an IMutateOperationResult. The ExecutePrepend() behaves similar to Prepend(), but instead of a Boolean it returns an instance of an IConcatOperationResult. ExecutePrepend() may also be used with a CAS value. With this overload, the return value is an instance of an IConcatOperationResult. To enable logging, you can tap into the logging capabilities provided by the Enyim.Caching dependency. Enyim logging currently supports either log4net or NLog. Start by adding a reference to either Enyim.Caching.Log4NetAdapter or Enyim.Caching.NLogAdapter. Both are available as part of the Couchbase.NET Client Nuget package or as part of the client library zip file. You could also get the projects from . If you use these Visual Studio projects, you’ll also need to add a reference to log4net or NLog (depending on which adapter you choose). Each of these dependencies is located in a “binaries” directory under the root “EnyimMemcached” directory. For log4net, your configuration should include an enyim.com section that defines which log factory to use along with standard log4net configuration. The log4net configuration will vary by the type of appender you are using. For more information on log4net configuration, see . You’ll also need to initialize (only once in your app) log4net in your code with the standard log4net initializer. NLog configuration requires setting the log factory to NLogAdapter and including the appropriate NLog configuration section. See https://github.com/nlog/nlog/wiki for more NLog configuration details. The following sections provide release notes for individual release versions of Couchbase Client Library.NET. To browse or submit new issues, see Couchbase Client Library.NET Issues Tracker. 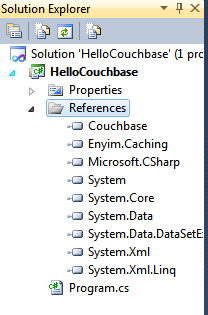 The 1.1.6 release of the Couchbase.NET Client library is a build only change, providing signed assemblies for both Couchbase.dll and Enyim.Caching.dll. The logging assemblies have also been signed. 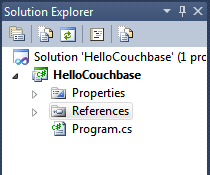 The 1.1.5 release of the Couchbase.NET Client library includes fixes for issues NCBC-42, NCBC-43 and NCBC-49. With this release, client bootstrapping is now performed off of /pools and the heartbeat check is configurable. Prior to version 1.1.5, the.NET client would get cluster information by first bootstrapping to a node at /pools/default. While this approach is generally safe, the client should have bootstrapped off of /pools as /pools/default might not be the correct second URI in the handshake sequence. The.NET client performs a heartbeat check on the streaming connection it maintains by querying the bootstrapping node at periodic intervals. The URI it used previously for bootstrapping was the above bootstrapping URI. This release allows for this URI to be configured, along with the interval. Disabling the check is also allowed now. The default values are to check the /pools URI every 10 seconds. The heartbeatMonitor element is a sibling to the servers element. The 1.1 release of the.NET Client Library contains a series of new API methods designed to provide developers with more details about the success or failure of an operation performed by the client. The existing API methods remain in place and as such, these changes are not breaking. Each of the new methods has the standard API method name prefixed by Execute. For example Store becomes ExecuteStore. Each of the new Execute methods returns an instance of an IOperationResult, with is extended by various operation specific interfaces - IGetOperationResult, IStoreOperationResult, IConcatOperationResult, IMutateOperationResult and IRemoveOperationResult. IOperationResult defines common properties available to all results returned by Execute methods. //Was the operation successful (i.e., no errors or exceptions)? Store, Get, Mutate and Concat operation results all return Cas values. Get operation results also expose HasValue and Value properties. Most failures are likely to fall into one of two categories. The first are conditions that the server won’t allow. For example, a Cas operation with an expired CAS value would be a failure. Attempting to add a key when that key already exists would also be failure. The second category of likely failures would occur when the client can’t connect to a node. Both categories of failures are likely to be reported by lower-level components within the client library. These components handle these errors gracefully and then log the problem. Before 1.1, these failure conditions were swallowed and did not propagate up to the caller. As a consequence, it is a good idea to check the InnerResult for a failed operation result.